Balance is hard. Balance feels nearly impossible as a parent. Yet like a pendulum swinging back and forth (back and forth and back and forth), we are designed to have a similar rhythm in our lives. Moving from rest to work to rest to work. Paying attention to the creation story of Genesis 1 we see this rhythm begin. God created the world and everything in it – and God’s final creation was human kind (day six of the narrative). Then on day seven, what did God do? God rested! Which means the very first thing people did with God was rest! Then, on day eight, what happened? These newly formed and rested folks got to work. God gave them birds and beasts and all the plants – to have as food, but yes, also to be caretakers. After a day of rest there was work to do. Good, fulfilling work. But do you notice again how that rhythm starts? We (human kind) rested with God. AND THEN worked. See that? Working from a place of rest. And so for us the shape of our lives no longer needs to be: pour out your heart and soul and sweat and then collapse in a heap once you hit the weekend. Instead, the rhythm starts with rest, then get to work. Yet – this is so hard! Are you – like me – a crumple-in-a-heap, go go GO until break or burnout kind of person? So many times we get sick just as vacation starts – because our bodies have worked too hard for too long. So what is rest? Also called sabbath. Rest is that which restores us. It can be sitting around time but is also hiking, playing, sailing, running, gardening, singing, cooking, listening to music, grabbing time with a friend, playing with your kids, watching a movie, reading a book, losing track of time, feeling free and untethered. Unscheduled time. Time free of to-dos and lists. In Genesis, Sabbath was with God. It is the stuff that connects us to who we really are and who God is. Time infused with the awareness of God-with-us. Sabbath can be a weekly rhythm, one day out of seven. But it is also a rhythm we cycle through in both smaller and larger scale. Rest is found in daily moments. Rest is found in annual vacations. Rest. Work. Repeat. 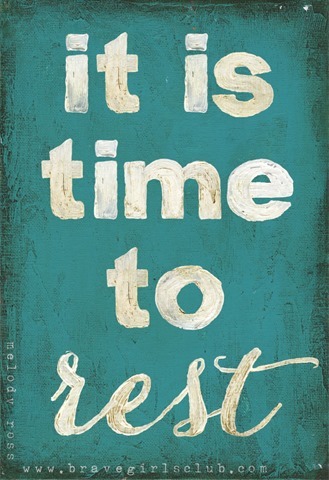 How will you find rest today? In a moment to breathe deeply the grace that is with you – through prayer, a song, a book, a walk, with your hands covered in flour or dirt or lost in the folds of blankets and jammies? How might you shape your week to include restorative time of sabbathing? A coffee date or trip to the zoo? Time at the beach or exploring the woods? What days in the next three months might be a time of vacation or a day away from it all? God stopped what he was doing to have a day of rest. Sacred time, restorative time. What moments will be those moments for you? Find your rhythm – and let God meet you there. Sara is a Lutheran mission developer on the Eastside of Seattle, WA forming a new community of millennial Jesus-followers. Working with and married to Jason, they together have a 4yo daughter and 6mo son. Sarah, you don’t know how appropriate this is! I’m posting on the SMC facebook page to share with parents because this is exactly what I’m preaching on this week. Terrific, Amy! God has a way of weaving current themes together in our lives — and I love when that bubbles up in beautiful, clear ways. For me, those are the times when I can actually hear it! Wonderful.